What’s better than a free trip to Aruba? Just ask Doug Price. After five years of trying for a baby with his wife, Price gets the surprise he’s been hoping for. And his wife manages to capture his reaction on video. We love creative pregnancy announcements and this YouTube video will leave you feeling warm and fuzzy inside. Meet Doug Price and his wife, who are making a video to enter into a contest. Price’s wife explains that the couple are celebrating their 10-year anniversary and would love to win the trip to Aruba, as that is where they spent their honeymoon. 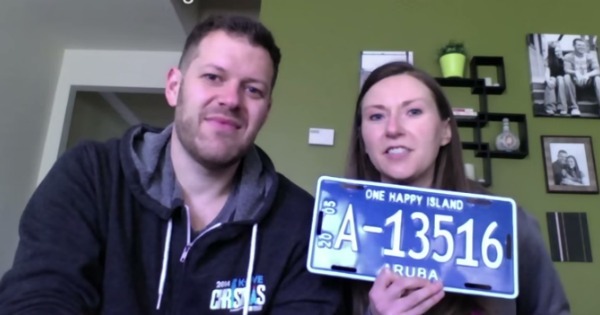 She then catches her husband off guard by showcasing a positive pregnancy test and mentioning that Aruba would be the perfect place to celebrate their babymoon. Price’s reaction proves just how much he wants to be a dad. After ten years of marriage and five years of trying, his face is filled with disbelief, happiness and gratitude. We wish them all the best and look forward to baby news in November. How did you tell your partner about your pregnancy? How did he react?